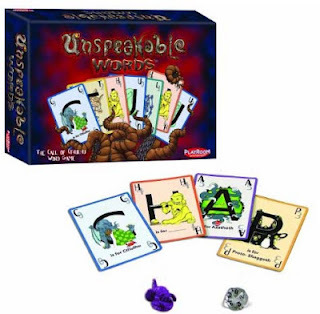 Unspeakable Words is the Call of Cthulhu word game. It's designed for 2-6 players, and takes around 30 minutes to play a game. The game comes with 96 letter cards, a twenty-sided die, and 30 Cthulhu pawns. 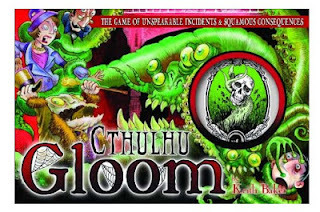 Cthulhu Gloom is a new version of the goth card game I've been enjoying playing with a couple gamer friends, Gloom. This one lets you use Transformation cards to mutate a character for the rest of the game session. There are already expansion sets for it, including Unpleasant Dreams.